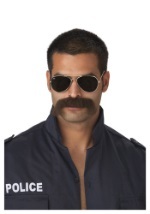 Play good cop / bad cop this Halloween with our selection of police officer costumes, great for any costume occasion. From realistic officer costumes, to funny cop and dirty cop costumes, you can go over the top and decide to be law abiding or breaking. Play with power dynamics when you join a friend in a prisoner costume for a fun cops and robbers couples costume theme. Be sure to visit our accessories page to add shackles, handcuffs, utility belts, boots, badges and more to assure that your police costume is top dog.